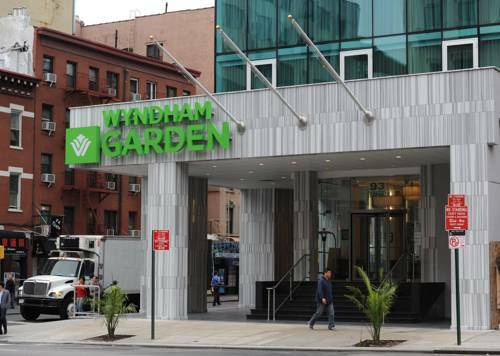 Modern, stylish and perfectly located, the Wyndham Garden Chinatown delivers exceptional service and amenities in the heart of downtown Manhattan. Just blocks from Little Italy's restaurant scene and the upscale shopping of SoHo, this hotel is steps away from public transportation to MoMA, Times Square, Central Park and other timeless attractions. Relax in the lobby bar and enjoy a delicious meal at the in-house restaurant, which serves all meals as well as room service and also has a bar. Stay connected throughout the hotel with the complimentary wireless Internet, and stay active in the fully equipped fitness center. Perfect for business and social events alike, this hotel offers over 1600 square feet of flexible meeting space including a banquet ballroom, boardroom and rooftop terrace with stunning skyline views. Pets are welcome. Rooms feature flat-screen TV and MP3 dock, and select rooms offer sweeping city views, private outdoor terrace and separate living area.